The image of C/2012 K1 PanStarrs was sent in by Adam Block from The University of Arizona and taken on May 5, 2014. The bright, green glow of a springtime comet shines in this amazing photo captured by an stargazer using the Mount Lemmon SkyCenter in Arizona. The image of Comet C/2012 K1 PanSTARRS was sent in by Adam Block from The University of Arizona and taken on May 5. This NASA graphic depicts the visibility path for Comet PanSTARRS C/2012 K1, which can be seen in amateur telescopes in May and June 2014. The comet can be found between the consellations of Ursa Major (the Big Dipper) and Leo in the northern night sky. 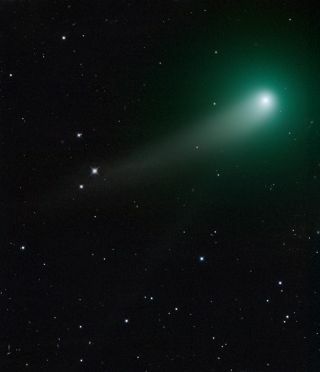 Comet C/2012 K1 PanSTARRS is a springtime comet that is expected to wax bright enough to possibly see with the naked eye. In April, it became bright enough to observe with a small telescope and it will make its closest approach to the sun near the end of August. C/2012 K1 PanSTARRS was discovered in 2012 by astronomers using the PanSTARRS telescope in Hawaii.